(1) Thaw frozen phyllo leaves in refrigerator overnight or on the counter for several hours. (2) Heat butter until just melted. (4) If phyllo leaves are larger than your pan, cut to fit, saving scraps for use also. Flatten out phyllo leaves on paper and cover with damp dishtowel to keep them from drying out. (5) Using a pastry brush, brush bottom of 9x13 pan with butter, and place one phyllo sheet to cover bottom of pan. Brush with butter (just enough to cover) and add another sheet. Repeat this procedure until you have six phyllo sheets, brushed with butter, in the pan. Add about ¼ of the nut mixture and spread evenly. (6) Top with six more phyllo sheets brushed with butter. (8) Take remaining phyllo sheets, as a stack, and place over last nut layer. Pour remaining butter over sheets. 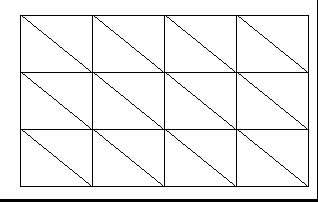 (9) Using a sharp knife, cut into 12 squares and then diagonally across each square, being sure to cut only 3/4 of the way through the layers. (10) Bake for 1-1/2 hours until golden brown. (11) After removing from oven, pour warmed honey over the top, allowing it to drizzle down through the cut lines of the baklava. (12) Cool and cut the rest of the way through the cut lines into triangles. May be stored in cool dry place for several weeks. -Don’t be too fussy about the layers of phyllo; if the sheet rips or is in pieces; just place the pieces in the pan to form a layer and brush with butter. -You can keep the thawed phyllo in the refrigerator for up to a month. -Keep the damp dishtowel on the unused phyllo sheets except when you are actually placing the sheets. If you work fast, you don’t have to replace the towel after each sheet, but you should cover the unused sheets when adding the nut mixture. If you get interrupted in the middle of the process, be sure to cover the unused sheets and also, that the sheets in the pan are covered with butter. -If you had to trim the sheets to fit your pan, use the trimmings (several pieces at a time) to form layers in the middle of your baklava. This way the top layers and bottom layers will be a whole sheet and the pieced sheets will be in the middle where they are not noticeable. -On this page is a diagram of how to cut (partially through the layers). Fun Fact for Recipe Baklava: Some ambitious bakers may make the phyllo sheets from scratch. This requires a very large surface to roll out the dough into the paper-thin sheets. Click here to go from Recipe Baklava to Nuts and Seeds page.